ELISION were on top form tonight, exceptional in technique and ferocious in sensation. The ensemble are regular visitors to King's Place, bringing to the venue an avant-garde pedigree that is vital to its curriculum. ELISION shift perspective just a little each concert in their focus on a core group of composers centred around Richard Barrett, Liza Lim, and, perhaps, Aaron Cassidy, though if their gene pool is limited then the character they draw from it, at least under normal conditions of convenience, is not. Tonight's show featured nothing from Lim or Cassidy, but showcased three works from Barrett alongside shorter works from Evan Johnson and Michael Spencer. Music from Rebecca Saunders and Timothy McCormack featured in addition. The concert opened at an elevated pitch of intensity and activity that is typical to Richard Barrett. His interference, for contrabass clarinet, voice and kick drum, was performed with admirable ferocity by Richard Haynes. I use the rather hedging 'admirable' deliberately; I found little in the work to grab onto, other that its sheer concentration of spectacle and its occasional timbral diversions. interference’s basic conceit of personnel, I will concede, is a memorable and effective one. air, for solo violin, was better. One of the basic conditions of musical experience is that a drama is played out in the listener's mind between what s/he knows and expects, and what she doesn't. The latter disrupts the former in varyingly precious ways. air, I think, makes a virtue of such expectation thwarting, re-inventing the violin as a solo instrument in every moment of its quest (and a quest it very much is). Graeme Jennings was a captivating guide here, totally immediate even as he receded further into the distance of musical gesture. The danger inherent to Barrett's favoured type of musical hypertrophy is that it can veer into sheer tedium at a certain extreme. The closing work of the concert - at least until its pedal steel and hand drum-enhanced thrill ride finale - the violin-led wound, unfortunately suffered from such tedium. And I'm afraid to say that Timothy McCormack's One Flat Thing, closing out the first half, left me tremendously bored for similar reasons. Evan Johnson and Michael Spencer's two short works (though they were nowhere near the programme's stated length for each of one minute), à un quart de voix and Ungrund IIIb, provided much needed contrast. Johnson's barely-there cello drones and glistening wind traces proved particularly gripping in their spectral invocation of Berlioz's enigmatic performance marking that is commemorated in the work's title. 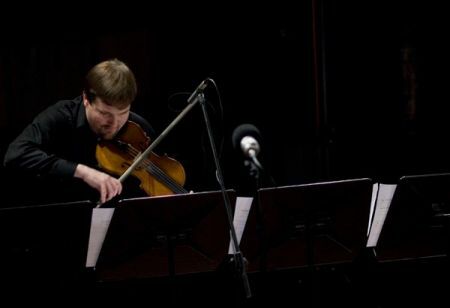 Rebecca Saunders' to and fro, a staging of the Beckett line 'to and fro in shadow from inner to outer shadow' from Neither, throws Peter Veale's oboe and Jennings' violin to opposite sides of the stage, only to draw them close to each other in the shadow play of their music. Veale produces sparks of harmonics and wind swept dyads, Jennings at first trying to contradict these before instead arrogating their contour through close tracking and vivid mirroring. It is a fragile and beautiful work, appearing particularly so after the hectic schedule of the opening two Barrett works. ELISION's next concert at King’s Place is scheduled for March 2011. Don't miss it!